This is somewhat of a melancholy review for Missile Test. Not only is this the last film of this year’s Horrorshow to be directed by Terence Fisher, it is also the last film he directed, period. He directed films for a quarter of a century, sometimes putting out three or four in a year. Before I began this Horrorshow, I had never heard of Terence Fisher, but what I discovered was a workaday director who could be counted on to helm a film with care, attention to detail, and strong pace. He was in no way innovative, and his films display the difference between craft and art. Terence Fisher was a craftsman, and his trade was directing movies to make his producers money. He was very good at that, and he was very good at keeping me entertained. Released in 1974, Frankenstein and the Monster from Hell is not just Fisher’s swan song, it is the final film in Hammer’s Frankenstein franchise. In the previous entry, The Horror of Frankenstein, Hammer discarded all of its previous Frankenstein continuities and started from scratch, handing the lead role to Ralph Bates. Bates did just fine in the role, but not having Peter Cushing play Frankenstein left a void. But Cushing is back for this film, looking very gaunt and hollow-cheeked, it must be said. It’s hard to tell if this film is another reboot, or if it connects to one of the previous films. It can be shoved into any of the continuities Hammer threw out there for Frankenstein. The film opens by showing the plight of a young doctor, Simon Helder (Shane Briant). Although fully capable, Dr. Helder doesn’t see patients. Rather, at some point in his studies of medicine, he found out about Baron Frankenstein and his efforts at resurrecting the dead. Helder decides to try out Frankenstein’s experiments for himself. The authorities catch wind, and Helder is convicted of sorcery. The sentence is five years in an asylum for the criminally insane. Helder takes it all in stride, never protesting either his innocence or his incarceration. There is no end to his politeness. Luckily for Helder and for us viewers, Frankenstein was convicted of a similar offense many years earlier, and sentenced to the same asylum. Frankenstein is not the type of person to let circumstances keep him down, so, as is typical for the character, it is not long before he has become the de facto head of the asylum, with the director, Adolf Klauss (John Stratton), indulging Frankenstein’s every whim. Frankenstein has taken on the medical and psychological care of the patients in the asylum. After Helder arrives, and Frankenstein learns of his medical training, he finds himself with another assistant. Frankenstein, of course, has ulterior motives. While he cares for the patients, he is also scouting among them for the perfect body parts to construct another of his monstrosities. Viewers don’t have to wait long in this film. We meet the monster early, and it’s not the best of reveals. I’ve written about Hammer’s makeup work time and time again this month. It just hasn’t been any good. In not one of the films I’ve watched for this month has there been satisfactory work when it comes to monster makeup. 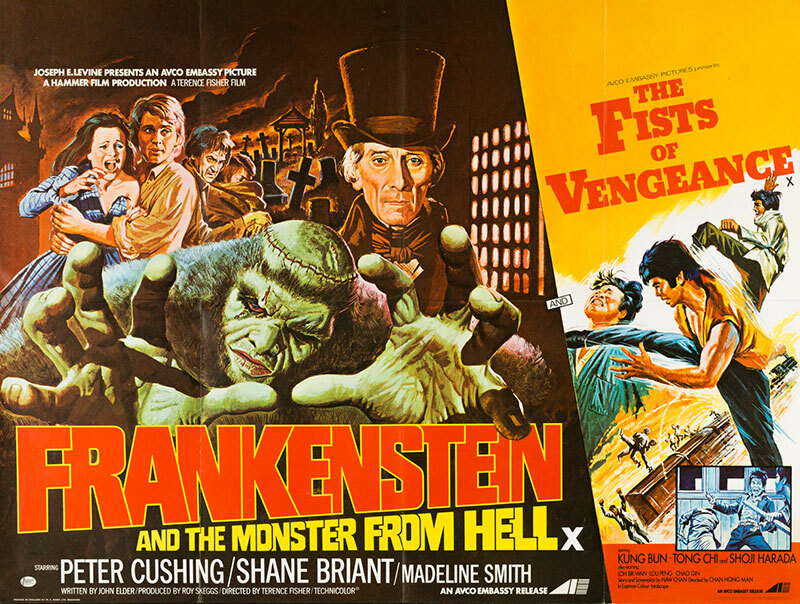 In this film, David Prowse again plays the monster, as he did in The Horror of Frankenstein. But it is a vastly different monster. In this film, Prowse is hidden away behind a Neanderthal skin. His face is covered by a mask with bulging features, and he’s covered with hair. He looks more like the missing link or a gorilla suffering from alopecia rather than something cobbled together in a lab. The mask Prowse wears isn’t very mobile, either. There’s a slit between the lips, meaning some slight movement was available, but for the most part the mask is static. And that’s a problem, because this monster can talk. When he does so Prowse’s words leak, muffled, out of the mask, yet his lips don’t move and his expression doesn’t change. There’s even a scene where the monster is racked by a coughing fit. There’s Prowse, coughing away, and his mouth never opens. I like Fisher’s direction, but it’s impossible to get past the monster. This would be the nadir of Hammer’s makeup work were it not for the box-headed monster from The Evil of Frankenstein. I just cannot believe that Fisher, or anyone else involved in the production, looked at the monster and felt it was acceptable. All it does is ruin the very thin veneer of believability this film has. So many of these Hammer films try so hard for seriousness, and then they roll out a monster that would be more at home in an episode of The Twilight Zone or The Outer Limits. That is, they look like something a TV production crew has to have ready in a day. Anyway, Frankenstein and Helder lose control of the monster during the film, and he becomes a danger to the residents of the asylum. All this leads to denouement, and an ending that left open the possibility for a further sequel that was never made. By this point, if a viewer has been keeping up with the series, there are no more surprises. Frankenstein is nothing if not reliable, and if he has managed to set himself up in relative peace, he will make a monster. It will become enraged, and it will have to be put down. All that an audience requires is the film follows its path well. Frankenstein and the Monster from Hell does that, but it’s burdened by ridiculous creature effects. This movie was everything I expected.